They give chocolate its claim to fame not just as everybody's favorite confectionery, but as a health food. Especially without sugar. 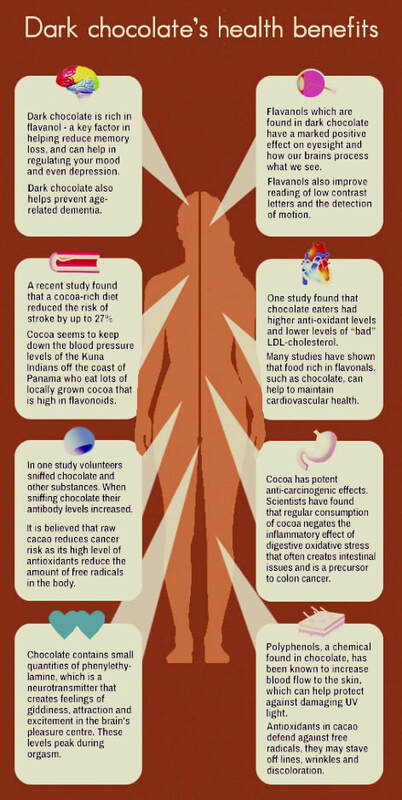 Most research looking into chocolate’s benefits has been performed using high flavanol doses. For this reason, to increase your chances of getting similar benefits, it’s best to stick to chocolate with at least 70% cocoa. The higher the cacao content, the more likely you are to reap some or all of the benefits, even by eating just a small amount. That's why Einstein chocolates™ contain 74% of the highest quality cocoa. Actually more, with the fine cocoa powder coating on them. Weight loss - yes, it’s true! Chocolate sure is a popular remedy for the mending of a broken heart. That, however, is not what I’m referring to. Over the past years, more and more research has emerged touting the benefits of the flavonoids found in chocolate (chocolate flavanols to be precise) on measures associated with heart health such as blood pressure and cholesterol levels. For instance, a fairly recent review of placebo-controlled randomized trials (a.k.a. the strongest level of research currently identified) pooled results from 42 short to long-term trials comprising over 1297 participants. The researchers were able to link chronic (but not acute) chocolate consumption to lower blood pressure. What’s more, marginal positive effects on cholesterol were also reported. But before you go out to binge on a full-fledged chocolate fondue meal, it might be worth noting that the effects are minor. Researchers are talking about a ± 4mmHg decrease in blood pressure and a ± 0.2mmol/L reduction in cholesterol. Nonetheless, these changes may predict a significantly lower 10-year risk of heart disease. Apparently, chocolate can decrease risk of stroke by up to a third! How so? Let’s take a moment to dissect this claim. This popular affirmation originates from a study that followed around a little more than 37,000 Swedish men during a period of approximately 10 years. They found that those who consumed the most chocolate had a 14% lower risk of stroke. But don’t get fooled into thinking that this means that eating chocolate leads to a lower risk of stroke. This type of study only shows that two things are related, not that one causes the other. For instance, in this study, those who consumed the most chocolate also tended to be slightly leaner and eat more fruits and vegetables than those who ate less of the sweet treat. So is it the higher chocolate dose or the participant’s general health-promoting behaviors that drove the association? With this type of study, your guess is as good as mine…. Can chocolate really help you fight the flab? As surprising as this sounds, it actually might, as long as it’s dark - which Einstein is! Here’s some proof. A study dating back from 2011 published in the journal Nutrition and Diabetes gave 16 young healthy normal-weight men 100g of either milk or dark chocolate 2 hours before being served an all-you-can-eat-style lunch. In the 2 hours preceding lunch, participants reported feeling more satiated, less hungry after eating the dark versus the milk chocolate. Their desire to eat something sweet, fatty or savory was also reported as weaker. What’s more, when meal time came around, the dark-chocolate group ended up consuming 8% less calories than their counterparts. Perhaps even more interestingly, just the act of smelling chocolate may have equivalent effects! This clever study found that satiation levels increased equally after eating 30g of dark melted chocolate or after simply smelling it. What’s more, appetite scores decreased similarly after smelling the chocolate or eating it. Apparently, the act of smelling the chocolate is sufficient to activate ghrelin, one of the appetite-regulating hormones. Can eating chocolate actually gift you with beautiful skin that’s less prone to burning when faced with UV radiation? According to German researchers, the answer is yes and chocolate’s high flavonoid content may be to thank. They recruited 24 women between the ages of 18 and 65 and had them consume either a high flavanol (326mg/d) or low flavonol (27mg/d) cocoa drink for 12 weeks. 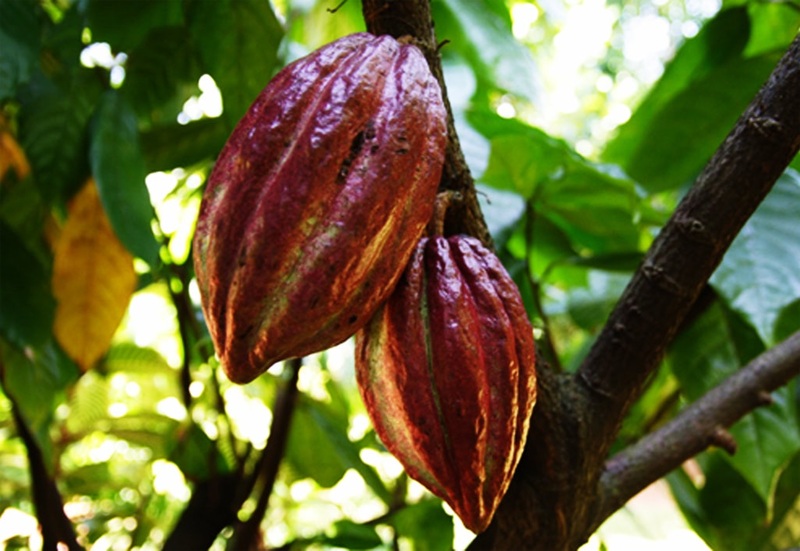 Following the supplementation period, they observed an increased blood flow to the skin, increased skin thickness and hydration as well as a slower development of reddening when exposed to sun-like UV radiation for the high-flavanol cocoa drinkers. Subjects who consumed the low-flavanol chocolate did not benefit from the same protection. A recent vaccine study published in the Journal of the Science of Food and Agriculture actually concluded that a cup of hot cocoa could help to keep colds at bay. Researchers vaccinated two participant groups against the H1N1 influenza virus. The first group ingested cocoa extracts during the 3 weeks leading up to the vaccination, the second didn’t. The researchers then measured natural killer cell activity (a.k.a the activity of the cells fighting off the vaccine-provided “invaders”) and found it to be significantly higher in the chocolate flavanol consumers. What’s more, several other studies report that theobromine (the primary alkaloid found in chocolate) as able to quiet coughs in both animal and human models. Of course, chocolate is not the only polyphenol-containing food that can help fight viruses. But it arguably is one of the tastiest. What’s a prebiotic? It’s a food or ingredient that can promote the growth or activity of useful microorganisms in your gut. You can think of prebiotics as the “food” on which probiotics feed. If you’re familiar with the varied health benefits of probiotics, you definitely understand why prebiotics are important. The good news? Cocoa flavanols can act as prebiotics. More precisely, a 4-week long intake of ± 500mg of cocoa flavonols per day was able to significantly increase bifidocateria and lactobacilli (a.k.a. beneficial bacteria) levels while decreasing clostridia counts (a.k.a. the harmful kind) in healthy humans when compared to a placebo. A second important observation highlighted by the research authors is that the seemingly bidirectional nature of the interaction between the cocoa polyphenols and the gut microbes. In other words, chocolate helps provide food for the beneficial gut bacteria to feed on whereas the bacteria help increase the absorption of the chocolate polyphenols. Talk about a win-win partnership! A fairly recent study published in the journal Epidemiology observed that out of 1681 pregnant women, those who consumed 5 or more servings of chocolate per week throughout their pregnancies had lower chances of developing preeclampsia (a pregnancy complication characterized by high blood pressure, sometimes accompanied by fluid retention and loss of protein in the urine). A separate study observed mothers-to-be who ate chocolate during their pregnancy to feel less stressed and more likely to report having a happy baby than those who didn’t eat any chocolate. Before you bring your box of Einsteins to your next prenatal class, keep in mind the following caveat; these type of studies, just like the one described in the “stroke” section above, are purely observational. This means they cannot show for sure that the chocolate is the cause of the reduced stress. Nor that chocolate actually causes babies to be happier. That being said, a little dark chocolate can only help! Most of us are acutely aware of the tendency to crave sweets (including chocolate) when stressed. But did you know that the relationship can work both ways? A study conducted in Switzerland (out of all places) and published in the Journal of Proteome Research found that chocolate can help keep you calm and collected. The Swiss researchers fed 30 healthy adults, some of which were highly anxious, 40g of dark chocolate everyday for a two-week period. They then took a look at the effect this had on the participants’ stress-response. Firstly, researchers observed that participants with higher anxiety traits showed a distinctly different metabolism (i.e. different hormone levels and gut bacteria) than their less-anxious counterparts. Even more interestingly, following the 14-day chocolate supplementation period, the stress parameters observed in the highly-anxious participants became comparable to those of the low-stress subjects. Talk about a tasty and effective stress-buster! Chocolate flavonoids are, believe it or not, also touted as boosters of your brain power. A study published in the Journal of Nutrition reported that, out of 2031 elderly participants, those who regularly consumed chocolate, wine or tea had significantly better mean test scores and lower prevalence of low cognitive performance than those who did not. Interestingly, participants who consumed all 3 had the best test scores and the lowest risk of poor test performance. That’s potentially because flavonoids, such as those found in chocolate, tea and red wine, can stimulate blood flow to the brain. In the case of chocolate, this effect has been shown in the brains of both young and old participants. As further proof, a daily dosage of 1,200mg chocolate flavanols was recently shown to result in improvements in brain function in participants over the age of 70. The question remains, can a lower dose of your favorite chocolate treat also help turbocharge your brain? Here’s some scientifically-backed proof to something most of us have intuitively known for a long time: Chocolate can boost your mood. Researchers gave a group of participants a dark chocolate drink mix containing either 500mg or 250mg of cocoa polyphenols or one containing no polyphenols at all. They then proceeded to test participants mood, memory and attention both immediately after the first dose as well as after 30 days of consuming the chocolate beverage. The results? After 30 days, the high cocoa flavonol dose was able to positively influence measures of mood such as calmness and contentedness. A plausible explanation for this effect is chocolate’s potential to release “happiness-regulating neurotransmitters” such as serotonin and dopamine.